Out of the cradle endlessly rocking. 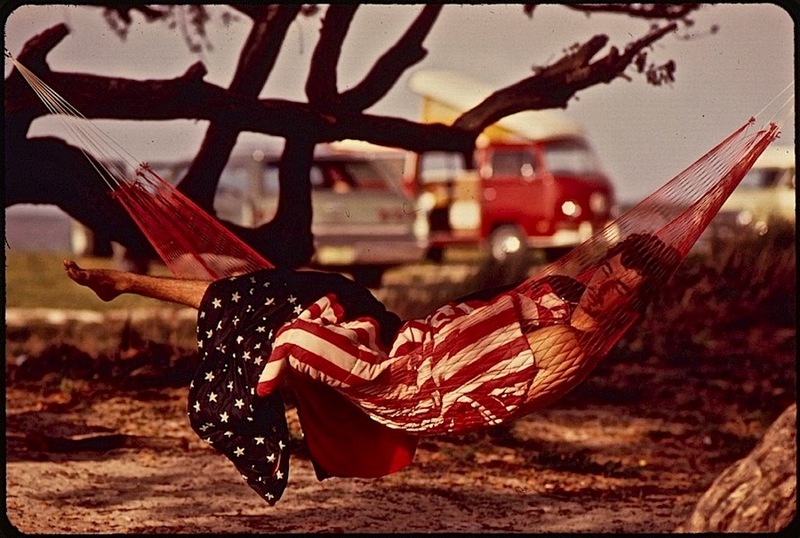 . .
“American dreams at Little Duck Key [– part of the Florida Keys]. Commercial camping sites and travel trailer courts have sprung up throughout the Keys. Even on the smaller Keys like Little Duck, where no facilities have yet been constructed, camping is permitted by local authorities,” ca. 1975. 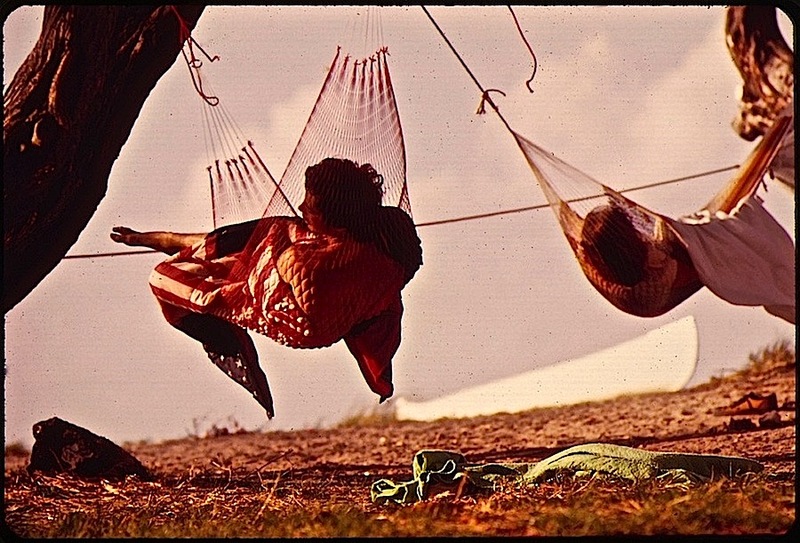 “Campers on Little Duck Key sleep in their own hammocks,” ca. 1975. “Beach at Little Duck Key. Little Duck, in the lower Florida Keys, is a tiny island which has not been commercially developed[;] the beach is open to visitors, who are not always careful to preserve its unspoiled appearance,” ca. 1975. All three photos here were taken by Flip Schulke for DOCUMERICA, a 1970’s photography program of the U.S. Environmental Protection Agency. They are shown with the original captions. The EPA hired over 100 photographers to “document subjects of environmental concern.” The work continued until 1977 and left behind an archive of about 20,000 images. 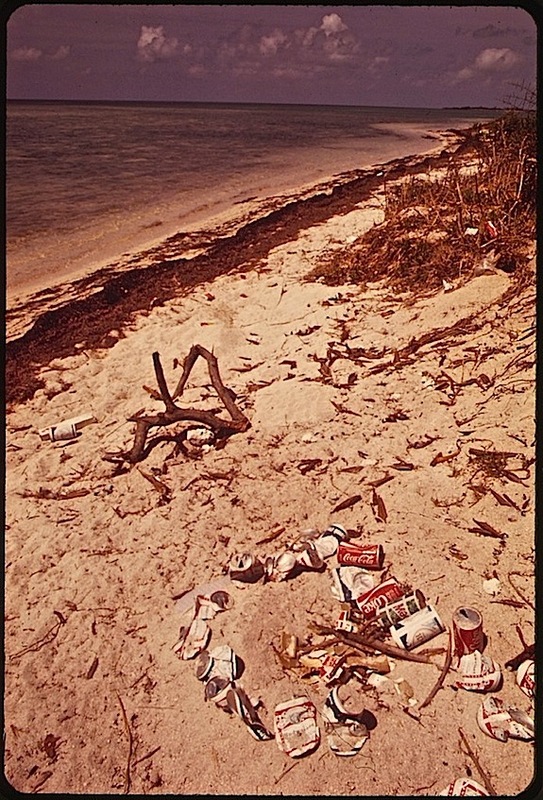 In addition to recording damage to the nation’s landscapes, the project captured “the era’s trends, fashions, problems, and achievements,” according to the U.S. National Archives, which held an exhibit of the photos, “Searching for the Seventies,” in 2013. Over the sterile sands and the fields beyond, where the child leaving his bed wander’d alone, bareheaded, barefoot . . . .
How great to be going to the Keys (after hurricane season)! I’ve never been (just Miami), but it looks wonderful.